According to Paulo Tsuyoshi Osato, president of Osato Alimentos, the relationship between the poultry integrator and the pharmaceutical firm coincides with global market trends to meet the increasing demand for natural and healthy foods. These days, success in food production hinges in large part on creating marketing niches. In Brazil, one poultry producer is successfully creating a global niche with Green Chicken. The Green Chicken. concept was hatched in 1998 when a Brazilian poultry integrator called Osato Alimentos decided to target the rapidly expanding consumer segment that purchases "natural chicken," meaning, birds raised without antibiotics and growth promotants. Based in Atibaia in Brazil's state of São Paulo, the firm faced a major challenge. Since "natural" poultry production practices weren't widely implemented in Brazil at that time, little related husbandry information was available. The new project got off to a great start when Osato formed an alliance with Coopers Brazil, a subsidiary of Schering-Plough Animal Health Corporation. "Starting in June 1998, we conducted three trials to determine if the use of the Schering-Plough Animal Health's coccidiosis vaccine was economically and technically feasible," says Pedro Shingi, a technical assistant for Osato. "All results were favorable, so we decided to replace in-feed coccidiostats with a vaccination program at our farms near company headquarters. Logistically, that would make monitoring and follow-up management easier." With positive trial results in hand, the first chickens bearing Osato's Green Chicken. trademark were bred. Coopers personnel helped Osato develop a protocol to administer Coccivac-B on day-old chicks with the Spraycox spray cabinet, which showers up to 100 day-old chicks at a time with the vaccine. This technology enabled Osato to vaccinate up to 80,000 birds per hour, dramatically reducing labor costs. Anticoccidials, including nicarbazin and monensin, were eliminated from the feed, as were growth promotants such as zinc bacitracin and virginiamycin. Prebiotics and probiotics were added to the ration to help colonize beneficial intestinal bacteria and prevent the activity of pathogenic bacteria such as Salmonella, E. coli, and Campylobacter species. Since implementing this new management regime, Osato Alimentos has experienced a significant reduction in all diseases and mortality rate, according to Marcos Palotta, Osato's technical manager. "At 40 days of age, vaccinated birds normally start to show a compensatory weight gain, and at 50 days their weight surpasses 5.17 lb. (2.35 kg. )," Palotta says, referring to the fast weight gain vaccinated birds show after an initial setback. Coopers continues to provide technical support for Osato's Green Chicken production, including monthly coccidiosis lesion scoring. In addition to increased production benefits with its Green Chicken., Osato is enjoying gains relative to the bottom line. With Coopers also providing marketing assistance, sales of Green Chicken have been increasing steadily since the product first hit the Brazilian marketplace in November 2000. Currently, Green Chicken. can be found in more than 400 retail outlets in the state of São Paulo. Butcher shops and grocery stores currently account for 50% of Osato's total Green Chicken. sales. Supermarkets and restaurants round out the remaining portion, with 30% and 20%, respectively. Osato expects to process 2 million Green Chicken. broilers this year, while total Brazilian production of the specialty is expected to reach 30 million birds. While it costs an average of 3% to 5% more to produce Green Chicken. compared to standard chicken, the former brings about 20% more at the retail level, according to Vilson Simon, director of AviSui, the Poultry and Swine Division at Coopers Brazil. "We feel these figures reflect product acceptance in specific consumer markets," says Maria Paula Yuko Osato, a marketing consultant for the firm. "Since Green Chicken. is readily available in several types of retail venues, consumers can easily include the product in their daily routine, even when dining out." 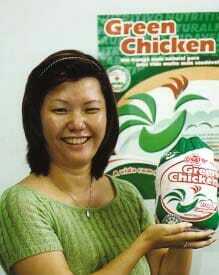 According to Yuko Osato, Osato Alimentos is marketing Green Chicken. as a product that is lower in fat content, more uniform in appearance, more palatable and emanating a more desirable aroma, compared to conventionally raised birds. Yuko Osato believes that, relative to the big picture and the long haul, Green Chicken. offers several consumer benefits, including healthier food, greater quality of life and longevity. The Green Chicken concept was hatched in 1998 Osato Alimentos decided to target the rapidlyexpanding consumer segment that purchases 'natural chicken,' specifically, birds raised without antibiotics and growth promotants. Osato Alimentos has a 37-year tradition in the global poultry and food markets. The firm processed 18.5 million birds in 2000. This year, production is projected at 24 million birds. For all of its products, Osato currently has over 3,000 customers worldwide, including restaurants, fast-food outlets, grocery stores, hypermarkets (large chain retailers similar to Wal- Mart), supermarkets, hospitals, and caterers. Total sales reached $30 million in 2000 and are expected to hit $40 million this year. During the 1980s, Osato pioneered the development of differentiated poultry products and initially cultivated a strong export market with Japan. Today, Osato's export customers include Japan, Hong Kong and Europe. Major product offerings for these venues include filets of thigh, filets of breast, wings, and differentiated cuts. Osato's overseas sales reached $6 million last year. The forecast for 2001 exports is $10 million. In October 2000 Osato satisfied the licensing requirements of the European Union to sell drug-free meat in Europe. The alliance between Osato and Coopers relative to Green Chicken. is a win/win work in progress. Osato continues to develop a successful marketing niche. Coopers continues to build its database of technical information relative to coccidiosis control in a drugfree broiler production model. "We are both committed to providing consumers throughout the world with healthy poultry products, so we believe Green Chicken.. and our partnership will continue to be successful," Tsuyoshi Osato says. Source: CocciForum Issue No.3, Schering-Plough Animal Health.